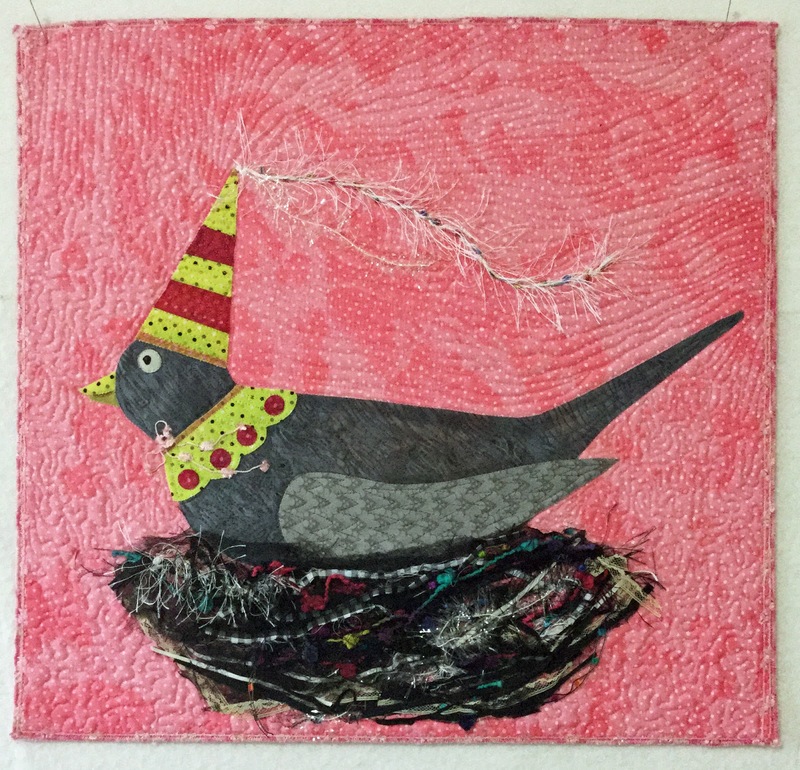 The source of inspiration for this art quilt from my mixed media series about nests was the word "Playful", which was suggested by my husband. OK, I have to admit I was a little stumped as to how to make an inanimate object represent a characteristic usually used to describe a person or an animal. I pulled out the sketch book and drew up some ideas. The key for me on doing sketches is doing it quickly and not judging each sketch. Our minds are able to blurt out many ideas if we just listen to them. After I sketched up a few ideas, I picked a nest with a bird in it that appeared to have gotten dressed up for a party. 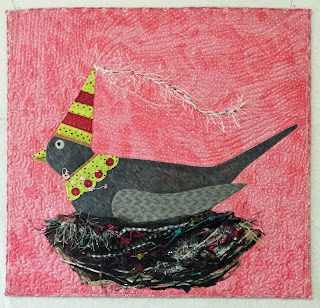 So far in my series of nest art quilts the nests are all a little bit different in the way they look, the way they are made, and the size. I am having so much fun making these mixed media fiber art pieces, and want that "playful" side to come out. The materials for this nest included a pile of yarn, shredded vintage bias binding, ribbon, lace, old book pages, tulle, and an old hair net. I piled them onto the top of the quilt and attached them with invisible thread by taking a couple of short stitches, then moving the needle an inch away, taking a few more stitches, and repeating this. When you look closely, you can see the long stretches of invisible thread that are acting like a net on top of the nest. It gives it a very unstructured and loose feel. Everyone wants to pet it! The edge was finished with several layers of zigzag stitches, then couched with pink decorative thread that matches the birds neck tie.